Peter D. Goodgame explored this idea in greater depth in his book Second Coming of the Antichrist. I bring it up here only to suggest one possible explanation for the decline of Uruk as a regional power at just about the time of the Tower of Babel on the timeline of history. After the humiliation at Babel, Nimrod/Enmerkar may have decided to head for new lands and a fresh start. Since his father, Cush, was apparently the founder of Ethiopia, nearby Egypt, which had been settled by Cush’s brother, Mizraim, may have been a logical place to start over. Think about that. Did Cush throw his brother and his brother’s family under the bus to give his son, Nimrod, a new start? By the way, the Sumerian King List mentions that the first city to receive the kingship after the flood was Kish. Remember, there are no vowels in ancient Hebrew. Could Kish have been named for Cush? And Enmerkar’s father, Mesh-ki-ang-gasher, is said to have “entered the sea and disappeared.” Maybe that’s how Sumerian scribes remembered King Cush, who sailed off into the Persian Gulf to establish a new colony with his brothers Mizraim (Egypt) and Put (Libya) in Africa. Now, that’s all speculation. Nothing so far in this article can be established for certain. And to be honest, the Sumerian King List has way too many names between the founding of the Kish dynasty and Enmerkar for the Kish/Cush theory to work. As the first dynasties in Egypt established themselves and began to build monuments that would surpass those left behind in Sumer, empires rose and fell between the great rivers Euphrates and Tigris. Akkad, under Sargon the Great, established a kingdom around 2350 B.C. that stretched from the Persian Gulf almost all the way to the Mediterranean, but it collapsed less than two hundred years later under the weight of invasions from the barbaric Guti, who swept onto the plains of Sumer from the Zagros Mountains in northwest Iran. The Guti, who we don’t know much about because they didn’t write, controlled Mesopotamia for about fifty years. They were finally thrown out by Utu-hengal, a king of Uruk, which set off a struggle for dominance between the city-states of the region. Ur finally emerged supreme, and what scholars call the Third Dynasty of Ur gave the region its last native Sumerian kings for a brief period, until about 2000 B.C. Then Ur was sacked by its ancient rival, the Elamites, who occupied what is now the far west and southwest of Iran, the region along the east side of the Persian Gulf. Into that power vacuum moved a group of Semitic-speaking people called the Amorites. Scholars think the Amorites originated in central Syria, around a mountain called Jebel Bishri, which is on the west side of the Euphrates between Deir ez-Zor and Raqqa. However, scholars still debate that point more than a century after the first scholarly books were published about the Amorites. Academics aren’t even sure the Amorites conquered the various existing Akkadian and Sumerian city-states. They may have been part of Mesopotamian culture all along and just somehow came out of the confusion around the turn of the millennium in control of the political machinery. What we do know is that around the beginning of the 20th century B.C., Amorite kingdoms emerged in what had formerly been Subartu (Assyria), Akkad, and Sumer, and, along with Amorite kingdoms in the Levant, they dominated the Fertile Crescent for the next four centuries. That was the world of Abram of Ur. We’ll have more to say about the Amorites, but know this: Their influence on history is much greater than you’ve been told. This was the belief of most scholars for many years until famed archaeologist Sir Leonard Woolley made his spectacular discoveries at Ur in Iraq. That Ur, with its magnificent ziggurat and stunning “royal tombs,” seemed much more appropriate as the ancestral home of the patriarch of the world’s great monotheistic religions than some place in Turkey that hasn’t been found yet. A recent discovery about some of the remains found by Woolley at Ur gives us a glimpse into the world of Abram. It also illustrates a tendency among scholars to view the ancient world through rose-colored glasses. Woolley and his team, who worked at Ur in the ‘20s and early ‘30s, found 1,850 burials dated to the second half of the third millennium B.C. Seventeen were so elaborate that Woolley, displaying a flair for marketing, dubbed them the Royal Tombs of Ur. One tomb in particular is worth our attention. It was the tomb of a noblewoman by the name of Pu’abi, an Akkadian name that means “commander of the father.” She’s believed to have died around 2600 B.C. Pu’abi was buried wearing a fabulous golden headdress adorned with carnelian and lapis lazuli. Lapis lazuli wasn’t easy to get back in the day; it was only found in Afghanistan and shipped to Sumer by way of Meluhha, a civilization on the west coast of India. Among the other treasures buried with Pu’abi, Woolley found the famous Golden Lyre of Ur, one of a dozen stringed instruments in the tomb when it was opened in 1929. Sadly, the Golden Lyre of Ur is one of the priceless treasures of antiquity that was lost when the Baghdad Museum was looted in 2003. It was found in pieces in the museum’s car park. To the point: Also buried with Pu’abi were fifty-two other people arranged in rows inside her tomb. These were apparently servants sent to the afterlife with her to ensure that Pu’abi had everything she needed for eternity. Now, Woolley, interpreting the scene with a romantic bias, decided that the servants had gone to their eternal rest willingly, drinking some toxic elixir and then peacefully lying down to await whatever came next. But in 2011, researchers from the University of Pennsylvania used CT scanners to examine six skulls from different royal tombs. They reached a much darker conclusion. Digital imaging technology and modern forensic science made it clear that the actual cause of death in all six cases was blunt force trauma. Instead of quietly drifting off to their eternal rest, the victims had been bashed in the back of the head with the business end of a battle-axe. That dumped a large bucket of ice water onto Woolley’s vision of an idyllic death scene. Keep that in mind the next time you get really aggravated at the sense of entitlement displayed by politicians, pop divas, and first-round draft choices. At least when they die, they don’t take dozens of people with them. 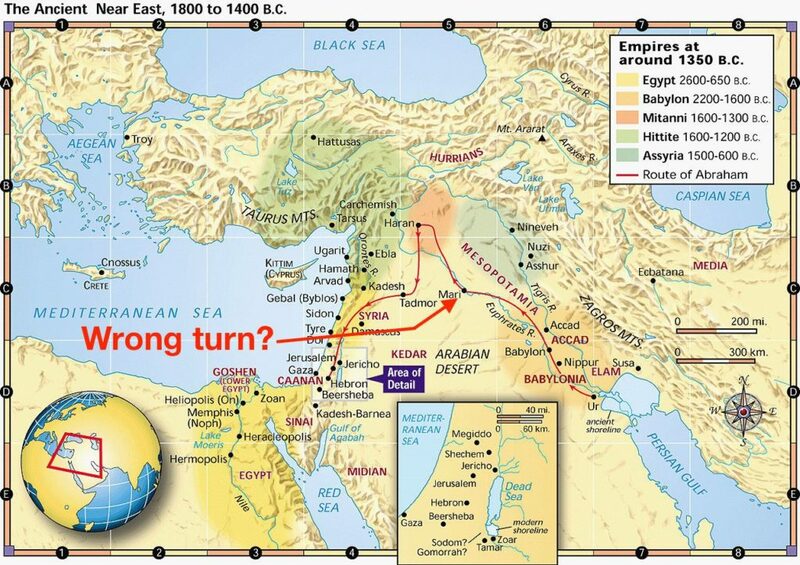 Well, because of Woolley’s truly incredible discoveries, Jews and Christians revised the standard map of Abraham’s journeys to show a long trek from southeast Iraq to southeast Turkey, and then on to Canaan. Prior to Woolley, scholars assumed that Abraham’s Ur was somewhere near Harran, about ten miles inside Turkey along the Balikh River, a tributary of the Euphrates that joins the great river at the Syrian city of Raqqa. Harran was a merchant outpost in Abraham’s day, and it was perfectly situated for it. It sat on a trade route from the Mediterranean to Sumer, linking the cities of Antioch and Carcemish with Nineveh, Babylon, and beyond. This is consistent with what we know of Abram’s livelihood, who seems less like a shepherd and more like a traveling merchant who conducted business with men at the highest levels of government, as evidenced by his interactions with local kings in Canaan and the pharaoh in Egypt. Harran is also the name of one of Abraham’s brothers. It’s probable that his brother was named for the city and not the other way around, since the city first appears among records recovered from the ancient city of Ebla dated to about 2300 B.C., some 300 years before Abraham. The great scholar of Near Eastern history and ancient languages Cyrus H. Gordon made a strong case for Abraham’s origins along the upper Euphrates rather than in the heart of Sumer. Gordon, writing in the Journal of Near Eastern Studies in 1958,⁠1 highlighted a then-recently translated Akkadian tablet from the ancient Canaanite city of Ugarit, a decree from mid 13th century B.C. by the powerful Hittite king Hattusili III to the king of Ugarit, Niqmepa. This decree regulated the activity of Hittite merchants operating in Ugarit, and identified the merchants in question as citizens of Ura, a city near Harran that specialized in tamkârûtum, or foreign trade. Niqmepa had apparently complained to Hattusili about the traders from Ura. In response, Hattusili decreed that the merchants could conduct business in Ugarit only during the summer months (no great loss—that was the only time of the year when farmers had crops with which to pay); the merchants would have to return home to Ura in the winter; and they were barred from buying real estate in Ugarit. Gordon observed that men who traded abroad, like Abraham, Isaac, and Jacob, apparently looked for opportunities to settle where they did business, but were generally barred from buying real estate in foreign lands. So there are enough similarities between the lifestyles of the patriarchs and the merchants of Ura, not to mention Ura’s proximity to Harran, to make the identification of Ura as Abraham’s Ur a strong possibility. Gordon went on in the article to demonstrate the linguistic possibility that the final vowel in Ura was dropped in the transition from Aramaic to Hebrew. Logistically, Harran was way too far north and east for Abraham’s father Terah to have made it a stop on the way to Canaan if he’d been traveling from Ur in Sumer. There were much shorter routes between Sumer and Canaan—for example, a trade route used by Amorites that linked Mari on the Euphrates to Damascus via Tadmor (Palmyra). In other words, Mesopotamians in the 21st century B.C. would have mocked anyone from Sumerian Ur who tried to get to Canaan by way of Harran. Ending up at Harran would have required missing one turn completely and then taking another in the wrong direction, away from Canaan. Put it this way: Traveling to Canaan from Ur by way of Harran is like driving from Nashville to Kansas City by way of Minneapolis. Travel from Ur to Canaan by way of Haran? Not likely. Finally, Woolley’s Ur was on the wrong side of the Euphrates. The Chaldeans were a Semitic tribe, possibly descendants of the Amorites, who founded the Neo-Babylonian empire in the first millennium B.C. That’s the Babylon of Nebuchadnezzar, not the Babylon of Hammurabi, who lived about 1,200 years earlier. But the Greek historian Xenophon, who wrote in the 4th century B.C., referred to another group of Chaldeans. They were a warlike people who were neighbors of the Armenians. They lived north of Ura and Harran, between Mesopotamia and modern Armenia. In another book, Xenophon linked the Chaldeans to the Carduchians, who were probably the ancestors of the modern Kurds. The Kurds today occupy territory along the borders between Turkey, Syria, Iran, and Iraq, an area that includes the places we’re looking at, Harran and Ura. Gordon also noted that greater Armenia, which was called Urartu from the time of David until the rise of the Neo-Babylonian empire, was in its earliest days known as Ḫaldi (the “ḫ” sounds like “k,” so it’s KALL-dee). In fact, the chief god of the Urartians was named Ḫaldi, father of the Urartian storm-god Teisheba (who was equated with Ba`al-Hadad). So Ur of the Chaldees was probably Ura of the Ḫaldis. Abraham came from a border region located between the Hittites, the Hurrians, Semitic kingdoms such as Ebla and Mari, Amorite territory, and the Subartans (Assyrians), not the heart of Sumer as we’ve been taught. Understanding Abraham’s origins helps understand the early history of Israel. Why? Yahweh needed to give the future Israel time to develop its own identity. That wasn’t likely to happen with His people surrounded by the temptations of decadent urban life. Witness what happened to Abraham’s nephew, Lot, when he settled in Sodom. Further, there is a cryptic comment God made to Abraham that relates to the spiritual history of the world down to the present day. He said to him, “Bring me a heifer three years old, a female goat three years old, a ram three years old, a turtledove, and a young pigeon.” And he brought him all these, cut them in half, and laid each half over against the other. But he did not cut the birds in half. And when birds of prey came down on the carcasses, Abram drove them away. Iniquity of the Amorites? Wait—what? Patience. That’s for a future installment in this series. 1 Gordon, Cyrus H. “Abraham and the Merchants of Ura,” Journal of Near Eastern Studies 17:1 (1958), pp. 28-31.